Vincent van Gogh is famous for paintings including Starry Night, Sunflowers, The Bedroom and Irises. What fewer people know is that he was also a passionate letter writer. Van Gogh’s letters are a great way of understanding him better, both as a man and as an artist. 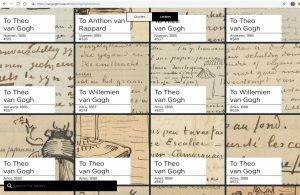 He wrote most of his letters to his beloved brother Theo, writing about his life, loves, friendships and art: the letters allow us to follow Van Gogh’s development as an artist. 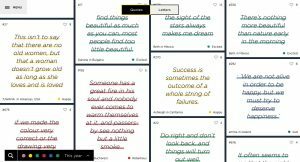 We also know that quotes from Van Gogh’s letters offer people consolation, inspiration and life lessons according to their popularity on social media. The source of these shared quotes is often unknown, incorrectly quoted or falsely contributed to Vincent van Gogh. The Van Gogh Museum in Amsterdam, The Netherlands keeps 800 of the approximately 900 letters known to have been written written by and to Vincent van Gogh. He wrote his letters in Dutch or French and a few in English. We asked ourselves: How do Van Gogh’s letters make today’s readers feel? Which emotions do his words evoke? What is it about his words that moves them? 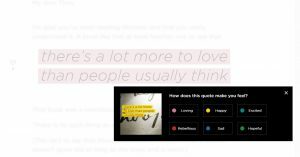 Visitors can also share their quotes to their friends on social media. Each quote is linked to the full letter on our website. That’s not all. 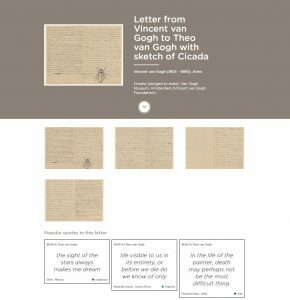 The site was part of a national campaign to reacquaint a broader public in The Netherlands with the letters of Vincent van Gogh. By sharing their favourite quotes, visitors were also in with a chance of being selected for the Highlights Exposition. This Highlights Exposition was not held in the museum, but in ‘Vincent van Gogh streets’ in towns, villages and cities throughout the Netherlands. With customized street lighting these quotes were projected on the pavement. 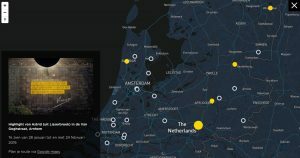 The customized map of The Netherlands published on the Dutch campaign page. The map marks the locations of the Highlights Exposition and shows the selected quotes. Each location links to Google maps. 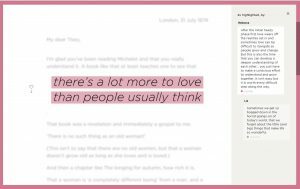 In addition to website and the Highlights Exposition, a Dutch-language podcast series was launched in which Dutch artists and authors read a letter and explained to the listeners what it is ab out the letter that moves them. 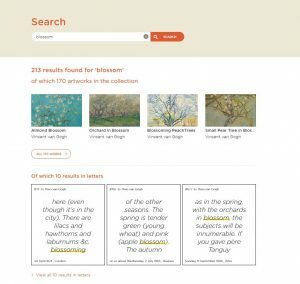 The podcast series, the website and the campaign introduced the Dutch public to a lesser-known aspect of Vincent van Gogh and the museum’s collection from various perspectives, and see the letters in the context of their own lives.